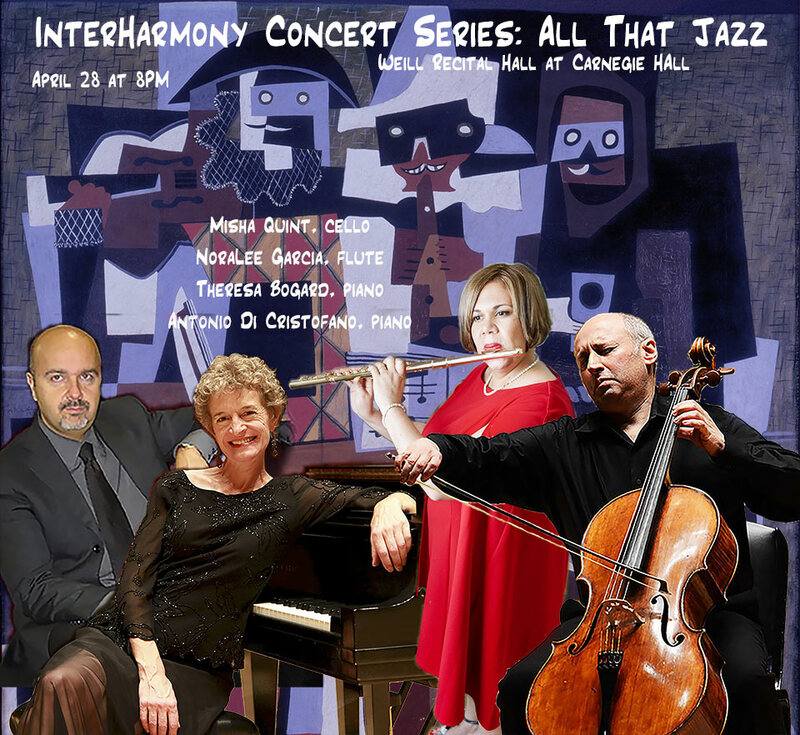 When somebody is looking for a jazzy evening, going to the “All That Jazz” final concert of InterHarmony Concert Series at the Weill Recital Hall at Carnegie Hall sounds like a very logical solution. 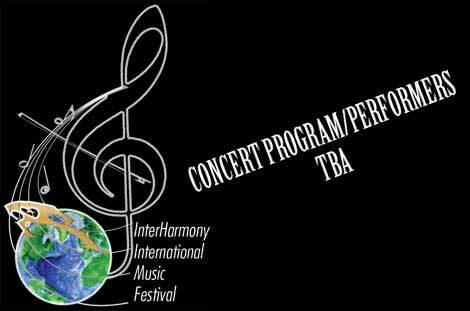 This time InterHarmony® International Music Festival’s Director, cellist Misha Quint invites his virtuoso friends from around the world to bring the New York audience a bouquet of diverse styles of music, which, like a range of exotic flowers, will deliver a special taste of its rare, seductive aroma. 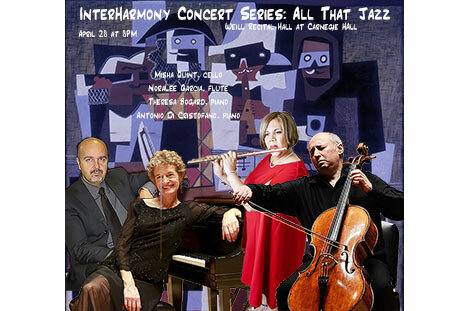 Tickets are $40 and can be purchased by calling 212-247-7800, at www.carnegiehall.com, or at the box office on 57th and 7th Ave.
With “All That Jazz”, InterHarmony offers a program that embraces all musical genres and connects them with the theme of jazz: from the technically demanding and elegant Baroque gem, Cello Sonata by Valentini, to the extravagant, unusual flute and cello duo, The Jet Whistle, by Brazilian composer Villa-Lobos; from lyrical piano solos by Chopin, leaping to a rhythmically charged piece by leading American composer Libby Larsen based on the African Dance, Juba; and finally the jazz Trio for Flute, Cello, and Piano of the famous Russian composer, Nikolai Kapustin. The opening of the Kapustin Trio immediately lets the listener know that they should expect absolutely anything, blasting with all possible virtuosic, almost classic jazz. Transitioning to a second slow movement, time stands still with deep emotion, showing the best singing qualities of each instrument, slowly spiraling to a finale, when the sudden realization comes that everything has still not been said. The third movement bursts into a spectacular dance of fiery passages, harmonies and chords, making the performers prove that the impossible is possible. 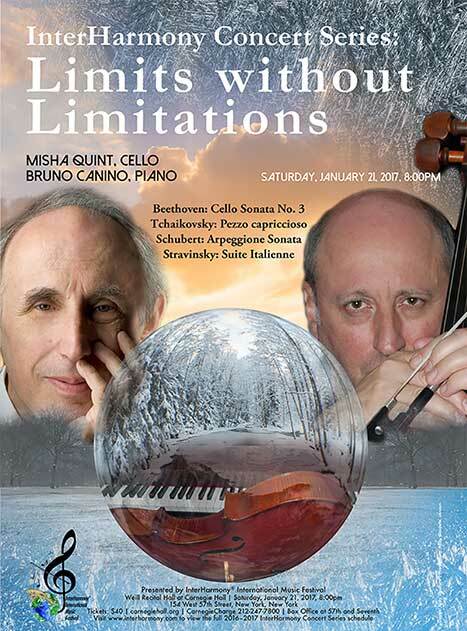 The performers are Misha Quint (cello), Nora Lee Garcia (flute), Theresa Bogard (piano), and Antonio Di Cristofano (piano), and their incredible achievements will add an additional exciting dimension to this evening. Nora Lee Garcia, is one of the most highly regarded flutist in the concert world today. A Powell Flutes Artist and Associate Professor of Flute at the University of Central Florida, appears throughout the United States, Europe, and South America as a soloist, chamber artist and teacher. A frequent performer for the National Flute Association, including Dallas, Orlando, Phoenix, Washington, D. C., Tennessee, Pittsburgh, North Carolina and Washington D.C. She has also appeared at International Flute Festivals such as: the Monterrey Flute Festival in Mexico, the Peru Flute Festival, Chile Frutillar Encuentro de Flauta del Sur del Mundo and the Spain Flute Festival. She participated as a judge for the International Flute Competition in Mexico City 2006 and the Chamber Music Competition at the National Flute Association 2006. Ms. Garcia’s recording was for Sony Picture End of the Spear 2006 and for the Warner Brother’s she recorded Music Expressions. 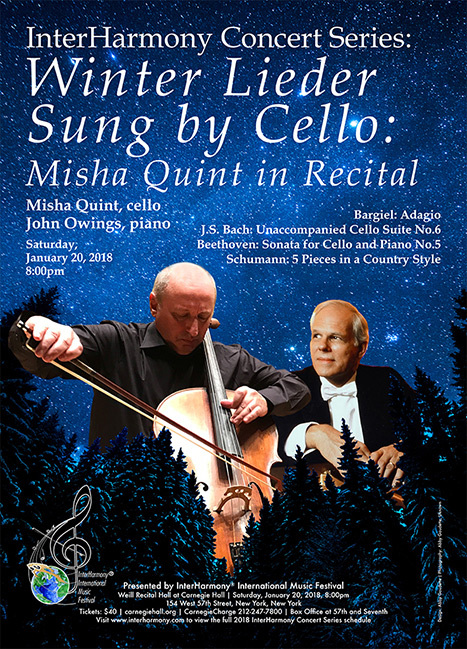 She premiered many works including Under the Sultan by Gary Schocker (2011),Prelude and Dance by Howard Buss winner of the NFA Newest Competition 2004. Other premiered works by Orlando García El Silencio despues de la lluvia (France, Moulin Ande, 1999), Robert Brownlow Concerto for flute chamber orchestra and vibraphone (Michigan- Interlochen Music Festival 2001) and Edmundo Vazques Alturas II (Chile, Escuela Moderna de Música 2001. She plays with Rene Izquierdo, guitarist and both are part of the Mira Duo. This duo have a concert tour for 2016-2017 Paris, New York and Spain and will record their first CD in 2017. Currently she is the principal flute of the Bach Festival Orchestra, Winter Park which she had played for 20 years. She is the co-founder and principal flute of the Florida Chamber Orchestra, Miami Florida. Nora Lee Garcia has studied with Bernard Goldberg, Michel Debost, Carol Wincenc, Bonita Boyd and James Galway. Theresa Bogard is an active performer combining varied interests in historical performance practice, contemporary music, chamber music and the music of women composers. She studied piano at the Sydney Conservatorium of Music in Australia, the University of Colorado at Boulder, and the Eastman School of Music. In 1988, she received a Fulbright grant to study fortepiano with Stanley Hoogland at the Royal Conservatory of the Hague in The Netherlands, and was a top-prize winner in the International Mozart Fortepiano Competition in Bruges, Belgium the following year. 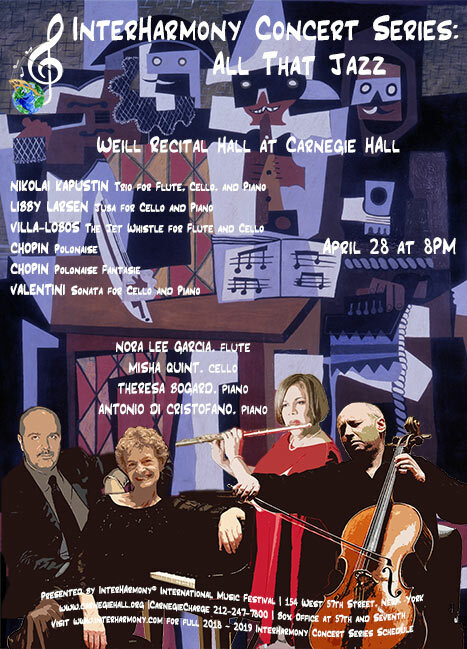 Theresa has presented programs of solo and chamber music in several cities in the United States, Mexico, New Zealand, Australia, Austria, Bolivia, Korea, Indonesia, China, and Brazil and is also featured on a compact disc recording of piano works by Louise Talma. Sought after as a collaborative pianist, Bogard she can be heard on two recordings for saxophone and piano with saxophonist Scott Turpen on the Albany label, Johann Nepomuk Hummel: Chamber Music at Schönbrunn with Red Cedar Chamber Music on the Fleur de son Classics label, Eastern Gems a disc of flute and piano music by eastern European composers with flutist Nicole Riner on Centaur Records, Music of Gustav Nolck for cello and piano with Beth Vanderborgh cellist, Chamber Music of Jennifer Higdon and a soon to be released recording with the Verismo Trio. In June 2000 she was one of ten international adjudicators for the First Governor's International Piano Competition in Saratov, Russia, and she has adjudicated numerous regional and national competitions in the US. Bogard is well known as a teacher and has been honored with numerous teaching awards. In 2008, she was chosen as the Wyoming Professor of the Year by the Carnegie Foundation for the Advancement of Teaching and the Council for the Advancement and Support of Education. Her students have distinguished themselves in national and international piano competitions including 6 national MTNA finalists. Her piano students have been accepted into graduate and undergraduate programs at Julliard, the Eastman School of Music, Cleveland Institute of Music, Oberlin College Conservatory of Music, Manhattan School of Music, Rice University, Peabody Conservatory of Music, Northwestern University, Indiana University, University of Wisconsin, University of Houston and the University of Michigan. Dr. Bogard is a Steinway Artist and is currently the head of the Keyboard Area and the Chair of the Department of Music at the University of Wyoming. Antonio Di Cristofano completed his piano studies in 1986 at the Conservatory “L.Cherubini” in Florence, under the supervision of M° Bacchelli. He has perfected with M° Damerini. He performs either as a piano soloist or in different musical ensembles; he played as a soloist with the Orchestra of the University of Milan, Strings Orchestra “Cantelli” of Milan, Chamber Orchestra of Florence, Symphony Orchestra of Lecce, Magna Grecia Orchestra, Sicily Symphony Orchestra, Solisti Aquilani, Milano Classica Orchestra, Sinfonica Abbruzzese, Sanremo Orchestra, FVG Mittleurope Orchestra, Radio Orchestra of Bucarest, Orquesta Sinfonica de l’Estado de Mexico, University Orchestra of Houston, Radiotelevision Albania Orchestra, Istanbul Chamber Orchestra, Praga Radio Symphony Orchestra, North Czech Philarmonic, Czech Philarmonic Orchestra, Izmir Symphony Orchestra, Iasi State Philarmonic, Wiener Mozart Orchestra, Toronto Sinfonia, Philarmonique de Montreal, Jerusalem Symphony, Slovak Filharmonie, Kaerntner Sinfonieorchester, Dubrovnik Symphony Orchestra, New York Chamber Players, Orquestra do Norte, Sinfonica di Sao Paulo, Thuringen Orchestra, etc. with conductors like G. Taverna, F. A. Krager, O. Balan, M. Bosch, M. Ancillotti, M. Alsop, N. Arman, C. Schulz, M. Zanini, C. Olivieri-Munroe, L. Svarovsky, A. Chernushenko, M. Sieghart and many others. He played, in Italy, for the most important Festival: the “Verdi Theatre” in Florence, the "Festival dei Due Mondi" in Spoleto, “Asolo Musica”, the Theatre of Alessandria, the “Bibbiena Theatre” in Mantova, the “Puccini Hall” at the Conservatory “G.Verdi” in Milan, “Politeama Theatre” in Palermo, "Auditorium San Barnaba" in Brescia, Festival Duni in Matera, etc., in Romania (Aeteneum and Radio Bucarest, ecc. 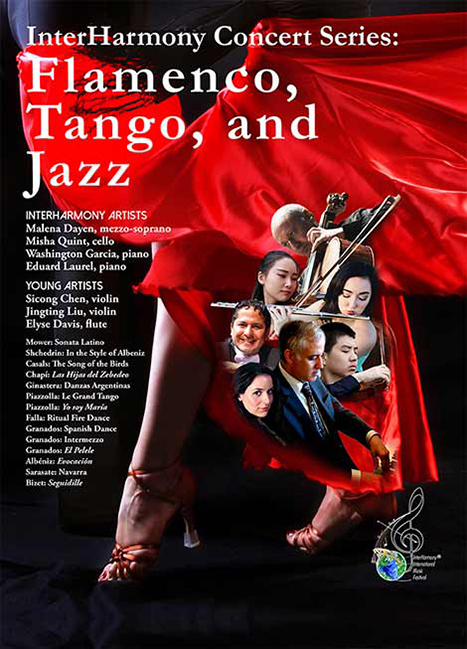 ), Espana (Festival de Vigo, Toledo Festival, Jeunesses Musicales de Sevilla), Mexico (Belles Artes Palacio, Revueltas Auditorium), USA (Moores Opera House of Houston, Gates Concert Hall in Denver, Washington International Piano Festival, ecc), Turkey (Istanbul, Izmir and Adana), Croatia (Dubrovnik – Rector Palace), Czech Republic (Praga – Smetana Hall and Dvorak Hall), Russia (Ciaikovsky Conservatoire), South Korea (Seoul – Leeum Auditorium), France (Nancyphonies Festival), Austria (Konzerthaus – Klagenfurt), Germany (Gasteig – Munich), Chopin Society Warsaw, Canada (Toronto - Glenn Gould Studio), Grieg Festival in Norway, Yamaha Concert Hall in Tokyo, Swiss, Albania, Israel, England, Portugal, Bulgary, Ukraine, Belgium, Brasil, Serbia, Argentina, Sweden, South Africa, ecc. He recorded cd with Velut Luna and Millenium label. In 2006 and 2007 he mades the debut in Carnegie Hall – New York and in Konzerthaus and Golden Hall MusikVerein in Wien. He is often invited as a judge in international Piano Competition (Compositores de Espana – Madrid, Varallo, Cantù, Osijek, Gante – Pordenone, Parigi, Viardo – Belmont, Rachmaninov – Moscow, Iturbi – Valencia, Parnassos – Monterrey, Astana Merei International Competition -Astana, Baltic piano Competition -Gdansk, Bajic Memorial -Novi Sad, Hong Kong International Young Pianist Competition, Nordic Piano Competition - Malmoe, Mozart Piano Competition - Aachen, Louisiana Piano Competition, ecc) and to teach in Ciaikovsky Conservatory in Moscow, Valencia Conservatory, in the Summer Academy in Dubrovnik, in Shanghay, Xiamen and Ningbo Conservatory in China, in the SMC Academy in Seoul, In Valletta International Piano Festival, in Sofia Conservatory, in Thessaloniki Conservatory, in The Orpheus Academy in Wien and in many USA University. He received the Paul Harrys Fellows from Rotary Club. Recently he received the letter of appointment as Guest Professor at the Xiamen Conservatory in China.